A few months ago, I received a forwarded message from a friend which contained the first chapter of this book. And when I finished it, I wanted to read more. And by typing in email IDs 3 of my friends, I got to read the next chapter. A very good marketing strategy, I must say. Because, when I saw the book on the shelf, I just grabbed a copy. The language is simple. The narration is crisp and to the point. It’s like hearing a brother/cousin/male friend tell a story from his life. What I mean is there’s a quality of hearing a story from a very familiar person. 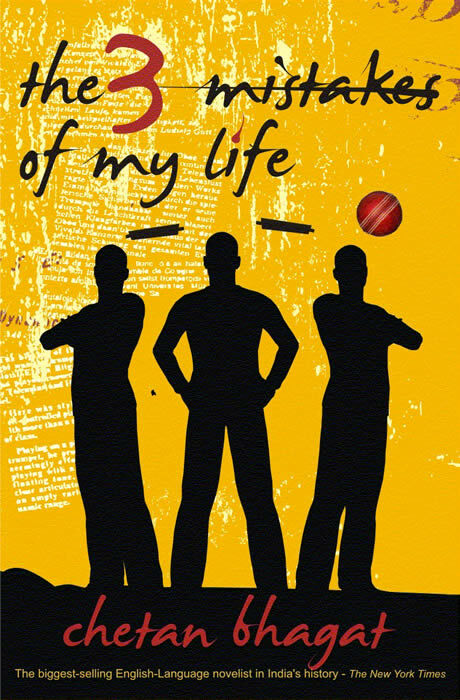 Chetan Baghat has dealt with sensitive issues like religion & politics, mixed a bit of a romance and cricket. And set it against the backdrop of the violent earth-quake and riots that shook up Gujarat a few years ago. Given this mixture, the book does not disappoint one of promised drama and action. In a nutshell this is what the book is all about. But it was definitely an enjoyable read. Walking into a school in my own neighborhood, I’d fallen in love with what I saw. It had such a friendly ambience, lots of space in front for the kids to run around and fantastically informal & colorful classrooms… Was sure my son would love it too. But as luck would have it, all admissions were closed. I left an application, nevertheless. When school began in mid-June, I’ had no choice but to send him back to that same distant school. Now I had to make the trip twice. Once to drop him and once to pick him up. Just when I’d braced myself for that routine, I get a call out of the blue from the school I loved. Am I still interested in a seat for my son? I was asked to meet them today. I’ve just met them and he’s got himself a seat!! Its just two minutes walk from home and he just loves it!! I also heard that some moms out there in the old school were smirking that I came back this year after fighting so much with the management.. So my pride is back too! I was actually excited about watching Dasavataram on the first day of its release. Especially when NDTV, Times Now & Headlines Today carried non-stop hype about the film yesterday. Someone told me NDTV had given it a 4 out of 5. I used to be an ardent fan of Kamal Hasan till I saw Hey Ram! “He should stop with just acting”, I thought. And with Panchatantram, Tenali, etc he did seem to make a come-back with just acting. But Dasavataram? A total three-hour torture! Why can’t someone tell Kamal to retire from the movies? He’s totally lost it! Maybe, just maybe the movie’d been watchable if the 10 avatars had been played by 10 different people. There’d been a cohesive story, at least. And someone tell me why, but why Kamal’s head looks so disproportionately big to his body in most of his Avatars? And so many characters are forced, just so the avatars add up to 10. Justification of the title! But if at all I have one good thing I have to say about the movie, its his avatar as Balram Naidu. We can see a bit of the old Kamal in that character. His Telugu accented Tamil is just too funny! But Kamal as Dhaler Mehndi who’s cured of cancer by a stray bullet?!!! Kamal as the white guy -( ex CIA who’s now on the other side of the law) with a huge head? The 8 feet Kamal who just cannot get a decent word out of his mouth because the mask is obviously limiting his lip movements? Again, Kamal as George Bush? And George Bush who’s clue-less about NA CL, which is actually common salt? The lovely Asin who does nothing but screech her dialogues and get on your nerves? This movie has been shot with the sole purpose of feeding Kamal’s ego and nothing else. I sat staring at the Rose bush. It was beautiful. Every summer, the first thing I did on visiting my ancestral home was to run to the back verandah to look at the rose bush. It was enormous. At least 15 feet tall, it towered over us, over the tiled sloping roof of the house. And pale pink roses bloomed all over the bush. Been in the house for generations, nobody really knew who planted it. My grandmother claimed that it’s been the same height from when she’d been a young bride of eleven, 60 years ago. 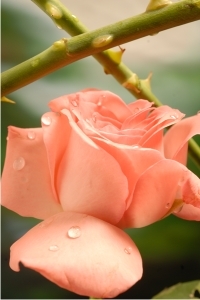 Whenever I squabbled with someone, I sat on the floor of the back verandah to look at the rose bush. And always, after the first ten minutes of staring at it with teary eyes, the blurred pink & green mass focused slowly to form a sharp image of the many petalled pale pink roses. Hearing a noise behind me, I turned. My uncle stood there, with his newborn daughter in his hands. Thrilled, I ran to them. He was always my favourite. Youngest of the lot, he’d stuck to the place with his now-single mother, after all his older siblings had flown off to greener pastures. Not that he minded. He was content living in this small village, with all the familiar people, traveling 5 kms to teach in a school in another village. In my younger days I used to wonder how he did it. Isn’t he missing out on all the fun of a city life? I used to ask him. The comfort of an attached-bathroom, for instance. He used to smile and say, he could build one here anytime he wanted to. But will he get to walk by the serene lake every evening? He’d ask. Or will he find the joy of walking in the fields and visually marking the line that ends his territory? I saw his point much later. Sometimes, when I used to travel in an over-crowded bus from or to my college, or crammed for my exams in my balcony where one can hear the non-stop traffic through the night, I closed my eyes for a moment and wished I was either sitting under the tamarind tree overlooking the placid lake or in front of the rose bush. Funnily I had my first big fight with my grandmother about the rose bush. While playing in my neighbour’s house, Idiscovered that it was not there just to cheer me up. My friend’s mother asked me, ‘So, How is the famous rose bush?’ She went on to tell me as a child, she used to beg off cuttings of it from my grandmother to be planted at her own backyard and how none of them ever grew. ‘There’s something special about the soil in your backyard’, she said. The Rose bush was famous, I realized. It was the pride of my family. People in the village talked about it. I was elated with this discovery. From then on, I started bragging about it to everyone. But that also landed me in trouble. My friends wanted me to take them to see it. I did. Once. Kalyani, the grocer’s daughter, was about my age, lived in the far end of my street. She was desparate for a glimpse of the rosebush. Excited, I literally pushed my grandmother out of our way, charged through the kitchen with my friend in tow. We burst into the back yard; I turned around to catch her expression. Was suitably rewarded with her awestruck stare. She’s going to talk about it for years, I thought gleefully. The rest of the day flew by. My mother and her visiting sister were away shopping in a town few miles away. Left to my own devices, I explored every nook and cranny of the house for hidden treasures, climbed a few trees, plucked all the guavas I wanted and ate them raw, without my grandmother’s knowledge. I was so busy having fun I barely noticed her sulking all day. In the evening when my mother had returned, after I’d claimed all my loot, I sat in the backyard looking at the bush in the fading light. I could hear the women in the kitchen talking in a low voice. My grandmother did most of the talking. After a few minutes my mother came to sit beside me. One look at her face and I knew I was in trouble. Maybe grandmother knew about the guavas. Maybe she’d counted them. I was panic-stricken. “What did you do today?” She asked me. Should I confess? Or wait for the axe to fall? I stared at my toe. ‘Your grandmother is very upset with you today’ she paused and looked at me. “I plucked only 4 guavas!” I said tearfully. “It’s not about the guavas, ma”, she said gently. “It’s my fault that I haven’t familiarized you with all the rules of this house” she continued. When she broke the news very gently to me I was horrified. In all my 8 years of existence, I’d never heard of anything so cruel. My grandmother it seems was upset because, I’d invited the grocer’s daughter home. Apparently, people of her caste were not allowed to enter our home beyond a point. Not only did I break that rule, but I led her through the kitchen to the backyard, thus polluting the sanctity of all that’s sacred in the house. After half an hour of pacifying me, she went back to the kitchen to help her mother prepare dinner. And I sat staring at the rose bush. Strangely, it didn’t cheer me up this time. I made peace with my grandmother long before the holidays ended. All it took was a new Kanjeevaram skirt she’d bought me for my up coming birthday. I was in love with the peacock blue silk & my grandmother became my hero once again. Now I sit in my own kitchen sipping tea, waiting for my mother. She called this morning to tell me she’d just got back from her last trip to the village. My grandmother gone for years, it took all the brothers and sisters so long to decide what to do with the huge house and the land in the village. Finally they closed up the house, spent the last week staying there for one last time savouring the house and the village, before strangers took over next month. An emotional time for all of them. It gives me a lump in my throat, thinking about it. The bell rings. My mother enters, looking a little worn out. Must have been all the traveling and the emotional strain of goodbyes. “Why didn’t you rest for a day or two” I ask her. “You really look beat”. Wasn’t sure if I should open up the topic of her trip. Isn’t it better to avoid it now? Inside, wrapped in a cellophane sheet, bottom part snugly encased in soil, is a cutting of my rose bush. Suddenly my vision blurs into a mass of green and pink.